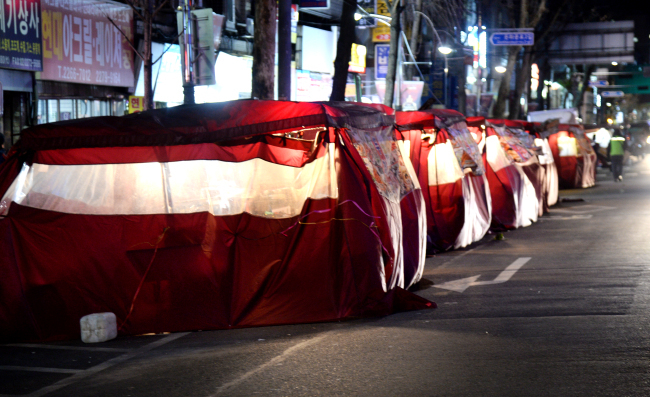 A foreign visitor to Korea may wonder what a brigade of what looks to be red tents may be doing lined up on the streets of Jongno-gu, Seoul. These pojangmacha, meaning a “covered wagon” in Korean, refers to makeshift eateries offering booze and food that have been a symbol of the common people here for generations. The origin of pojangmacha is unclear but many trace it back to the street vendors of the 1950s and ‘60s who would drag around their wheeled stalls, selling soju by the shot along with munchies like roasted sparrow. It grew along with the country’s economic development over the following decades, expanding both in size and menu while cementing its place as a haven for office workers to let off steam. It makes a frequent appearance in movies or dramas as a place where the distressed protagonist sits and binges on soju, usually with a concerned friend or love-interest by his or her side. Truth is not that far off, as real-life pojangmacha can be found packed with 40 or 50-somethings enjoying drink late into the night. If you walk into one of the technically-not-really-a-wagon tents, the first thing you will notice is that the price tag is surprisingly hefty. Fried pork, squid, fish and other meals are usually north of 10,000 won ($9), which is similar to the price tag found in proper bars or restaurants with actual tables, chairs, real walls and real service. Another thing is that most -- if not all -- dishes are ones typically associated with alcohol, collectively called “anju” Chicken gizzard in Korea is almost exclusively consumed with drinks as are chicken feet (dakbal) and stir-fried cartilage (odolppyeo). As so, you will rarely find someone who does not have a bottle of soju in front of him or her. The vendors usually open business around 7 p.m. or 8 p.m. and keep their shots open until the next morning. The choice in alcohol is beer and soju. Pojangmacha are usually a place where Koreans go for “i-cha (second round)” of drinks, rarely anyone’s initial choice for a get-together. It is also somewhere you go if you just want to have a quick drink by yourself. One of the controversies surrounding these shops is that many only accept cash. Inconvenience aside, the cash-only policy has touched off accusations of tax evasion. Earlier in the year, it was reported that most of the 30 to 50-seater pojangmacha in Gwangju are illegally operated without registration with the authorities. The unregistered pojangmacha are unregulated and unmonitored in terms of food safety and hygiene. The authorities occasionally raid the illegal pojangmachas -- with nearly half the pojangmacha in Jung-gu, Daegu closing business due to the district office’s continuous raids. This, however, sparks complaints about the government cracking down on livelihoods of citizens. Despite the overpriced and sometimes questionable food, dim lights, inconvenience of plastic tables and chairs along with not-so-friendly owners, Koreans continue to seek comfort in the flimsy red tents of pojangmacha. The nostalgia and the informal atmosphere of the makeshift bars always seem to draw those going out for a quick drink.